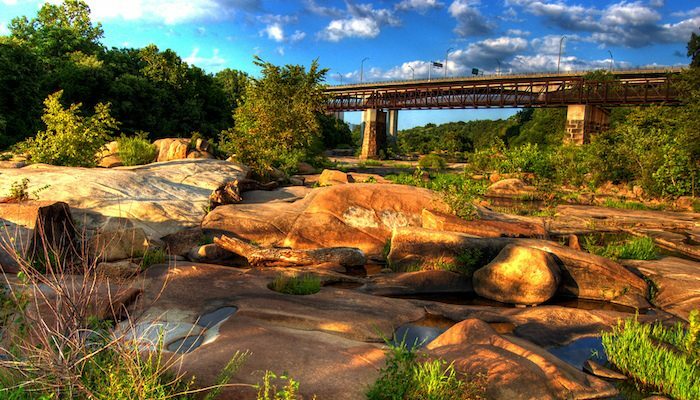 The James River Park System is comprised of more than 550 acres across the Richmond waterfront, making for miles of scenic running, with options for water views, shade, and woods. The local go-to route is a 5+ mile loop incorporating Belle Isle, which floats offshore just under the Robert E. Lee Bridge. From the north shore, use the pedestrian footbridge at Tredegar St. to reach the Belle Isle Trailhead. 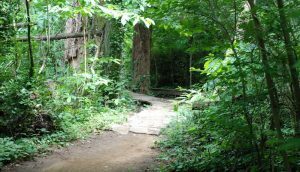 Then, head south to connect to the Buttermilk Trail. Follow the Buttermilk Trail west for 2.5 miles along the riverbank, then turn RIGHT onto Boulevard Bridge. Connect with the North Bank Trail, which carries east along the north riverbank for 2.75 miles back to the Lee Bridge. 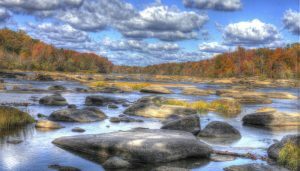 Another good option, which may be somewhat more secluded, is to begin at the Pony Pasture Trails and continue west on Riverside Drive to Hugenot Flatwater. Riverside Drive is narrow, and there is not much of a shoulder, but traffic is minimal, with the thin dirt trail following the road at times.